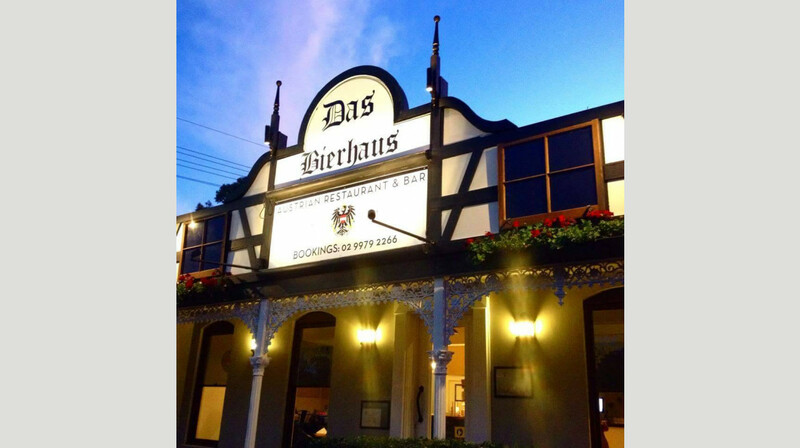 Operating out of one of Sydney’s oldest hotels, Das Bierhaus is Mona Vale’s very own Bavarian Bierhaus. 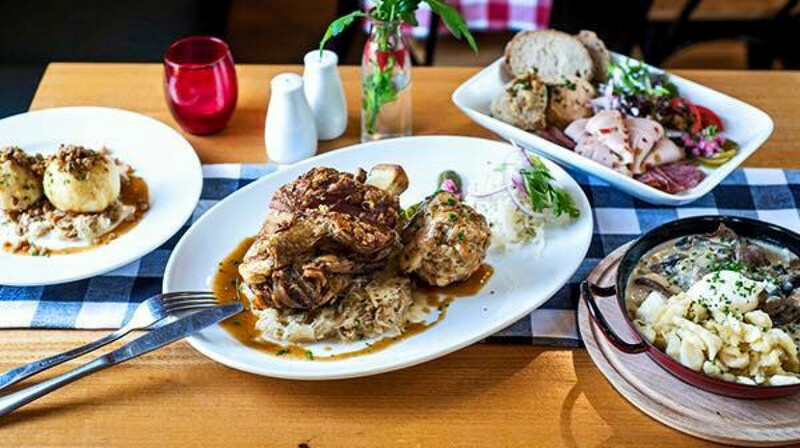 Founded by Austrian Stefan Tomaschuetz, Das Bierhaus sits in its traditional building nicely and has a unique and jovial atmosphere. 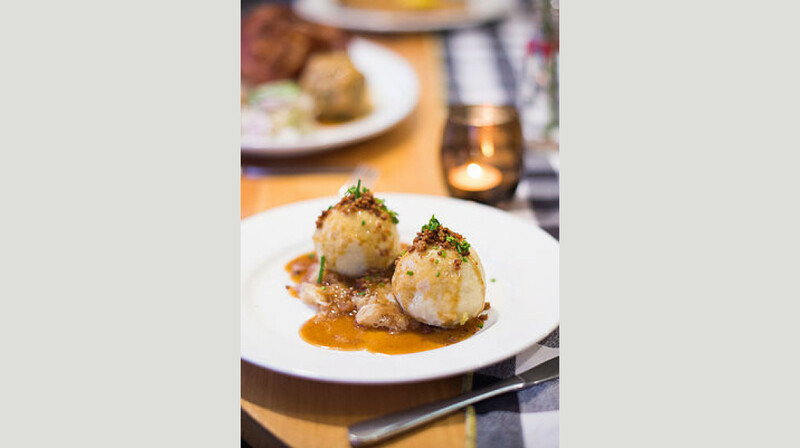 All food at Das Bierhaus is created in-house from authentic old German and Austrian recipes, just the way that grandma makes it, by our team of European chefs. 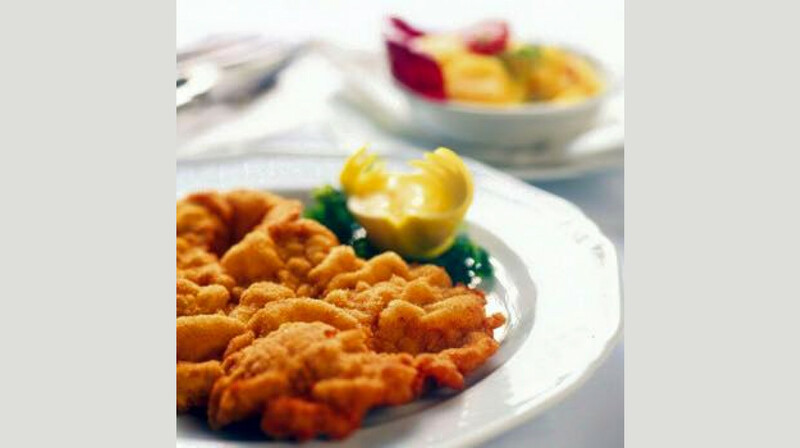 It’s ideal for date night, a special occasion, a meal with your family, or with a group of friends. Big servings - big service! We love this restaurant. Our go to for bdays and celebrations. Staff are always accomodating and friendly and smiling. Food servings are generous and tastes so so good. I have two children and the food and restaurant is great for them too. Even though we used first table booking they still let us take home kids leftovers and let my partner have the all you can eat ribs deal and $15 stein of beer deal. Amazing value with the first table voucher and incredible food and service. We went for my son’s 7th bday dinner last night and he had a really enjoyable night :)) We all did. From the moment we walked in, we were made to feel welcome. The food is excellent and the beer was fantastic! We are hoping to come back. This is a fantastic friendly family restaurant with a menu of great hearty meals. Highly recommend. The serving sizes are very generous! Delicious food and definitely worth going again. Particularly with first table, fantastic deal! Great food, pork belly was lovely! Nice atmosphere too on a Sunday night. Service a bit slow but it was a busy night! Like stepping into an Austrian Village very authentic, I've spent a lot of time in Austria with work and this is the type of place I used to eat at... portion sizes were very big but the prices were very low, how good is that? From the minute we arrived we were looked after by the staff really well. Food came out quickly. The pork knuckle was huge but a little bit dry, but tasty with condiments. the goulash was nice but a little small. Beef ribs fell off the bone and good taste. Food was awesome, food sizes were huge!!! Great service and delicious food with huge portions. Nice ambience in the outdoor seating area. We will be back! WOW - we will be back to this restaurant again! Das Bierhaus did not disappoint us! The food was excellent with generous servings, our waiter was attentive and interactive but not in our faces. We left with full bellies and smiles on our faces! Danke! There were 4 of us and we enjoyed our food. I had the crispy pork belly and it was really good. Great value! Good food, the place also has a lot of good deals running during the week. 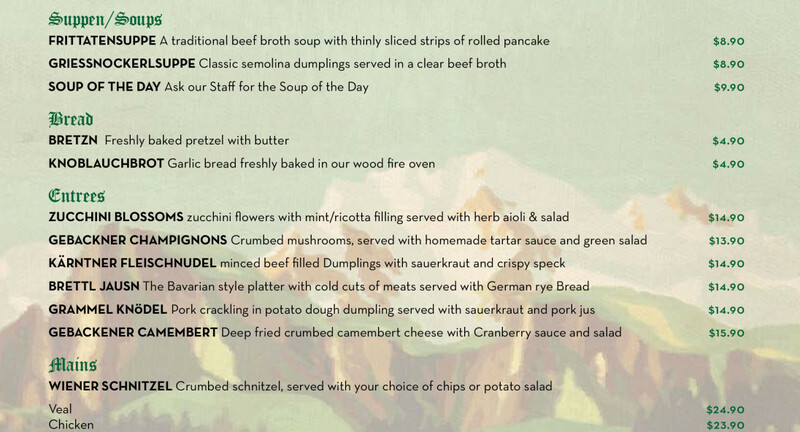 Particularly the all you can eat schnitzel, apparently the high score sits at 10.. get amongst it! Lots of laughs, lots of food. Excellent service and food. Would definitely dine there again. Food and service were great. The only thing was that being the first table does not create a lot of atmosphere. We loved our night at Das Bierhaus. Great atmosphere. Lots of yummy food. Lovely service. Lots of beer. Great night. Thank you. Good food, good service plus good company of long time friends!!! We'll be back. We arrived early and were well looked after until the restaurant service started. Fabulous food and great service with huge servings! Thanks for a lovely night. My husband & I had a fantastic meal at Das Bierhaus, the serves are huge, we started with crumbed mushrooms & salt & pepper calamari yum yum yum, even the salad on the side was delicious, we then shared a tasting plate that was also huge we didn't get near to finishing it, they will happily let you take the leftovers home. It was a bonus for us when we got there too cos it was happy hour, so we enjoyed a cocktail each. The service was very good we couldn't fault our night, except we both over ate. Fantastic service and the food was delicious. Huge portions so had to take the remaining food home in the supplied doggy bag. Have already arranged to go again next Tuesday with some friends!!! 5pm is early for dinner but it suited us as we had a movie to go to at 6.30pm. The service was very good with the waitress being friendly and professional. The prices were really good and excellent for the size of the meal. My husband had the pork belly and could not finish it, and I had the barramundi, which was delicious. We will be back because the meals are not overpriced and are good quality compared to another local restaurant which we used to use frequently. Well done Das Bierhaus. Stepping into Das Bierhaus was like stepping into a little town in Europe. The charms of the blue and white festive deco and the cute outfits that the wait staff wore were just the loveliest touches to the setup of the restaurant. The wait staff were lovely and patient, answering all our questions to this delicious cuisine that was new to us. They were attentive and friendly, putting us at ease throughout our entire dining experience. The food portions were generous, in fact we had to ask to pack away some of it as we couldn’t finish! It was reassuring to see other diners leaving with packed boxes too and the wait staff were very helpful. I had the pork knuckle and it was huge but satisfying. 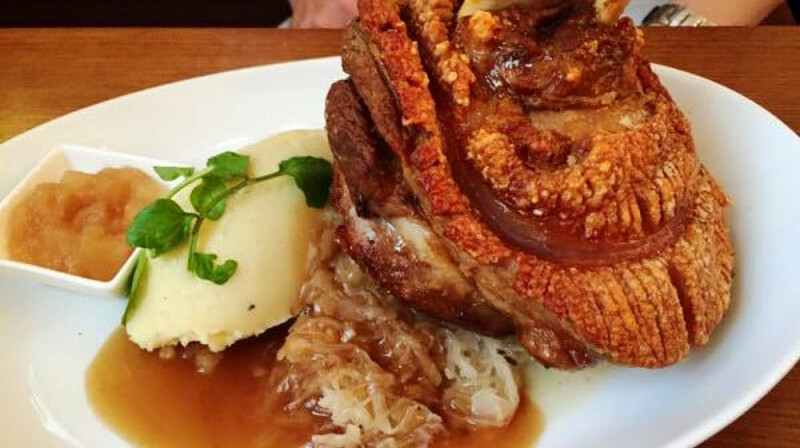 The crackling on the pork was crispy and perfect, and the meat was delicious and tender. My dining companions thoroughly enjoyed the schnitzels and the Cordon Bleu which was very smoothly minced up with a lovely ham and cheese filling. Kudos to the chefs for having cooked up such a lovely meal! 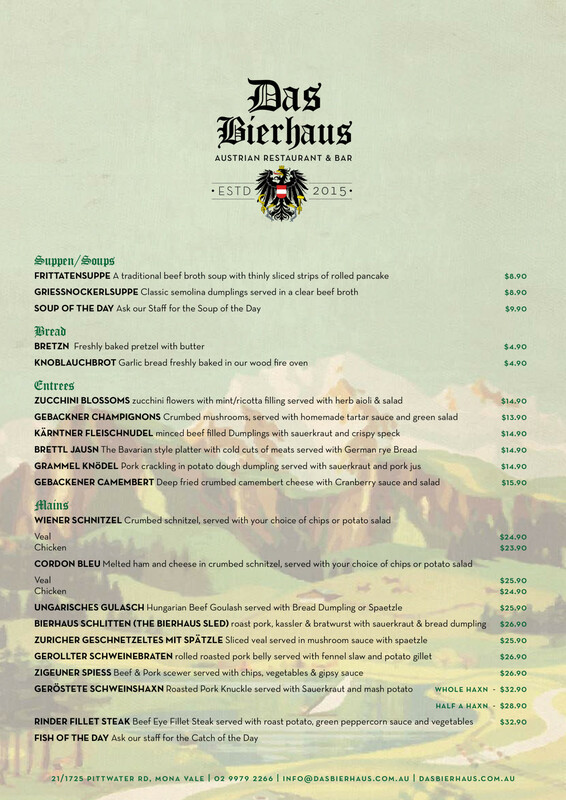 We loved our dinner at Das Bierhaus, and will definitely be coming back! Great friendly service and great tasting food. We will definitely be going back soon. Great service, good food. It was our first time booking with First Table and we will do it again. We had a lovely night. Special menu for Mother's Day which was very nice and very filling. Staff still honoured the First Table deal. As the Mother's Day choice of dining we could not have been happier. Thank you for a wonderful evening. 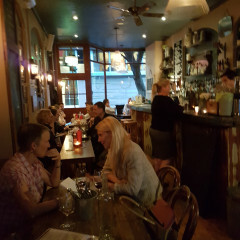 We made our First Table booking on the same day that we dined and while it turned out that Das Bierhas was not aware of our booking, they were still super welcoming and accommodating. 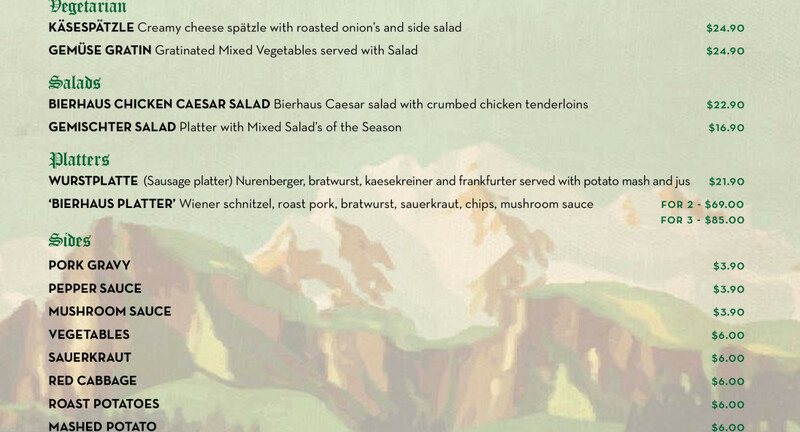 Not surprisingly being a German restaurant, the choices for vegetarians were limited, however, meat eaters were spoilt for choice with very generous servings of food. 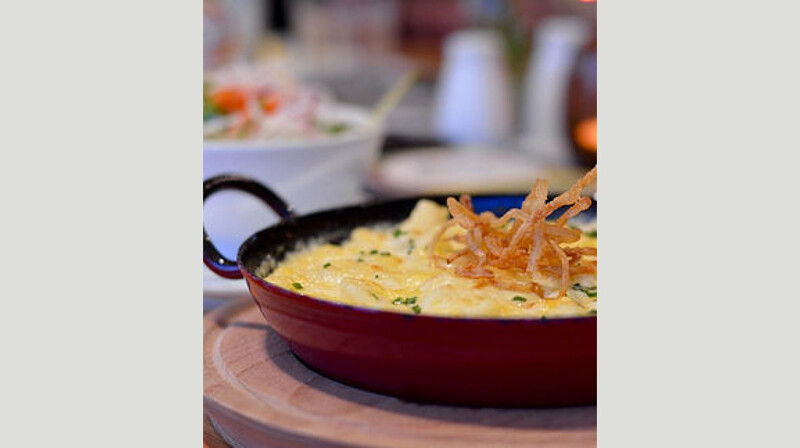 Excellent hearty German food, good atmosphere. Even though we arrived early, we were welcomed into the bar area to beer and cocktails. 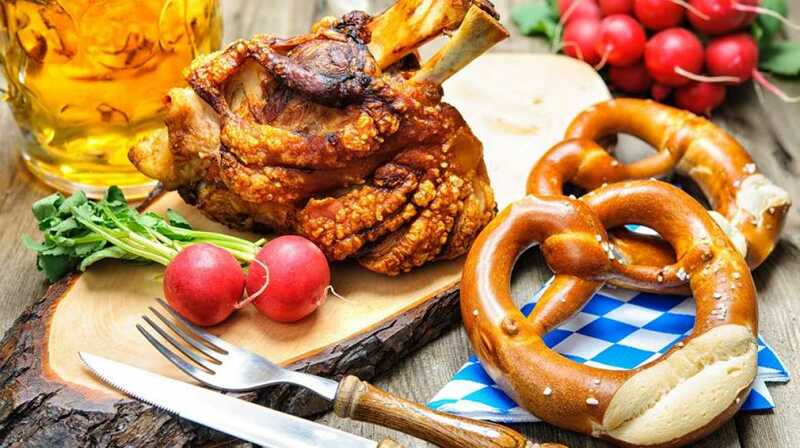 The waiter knew the beers and was very helpful.The meals were fabulous and went perfectly with the freshly made pretzels and little garlic loaves, and extra serving of sauercraut. Definitely worthwhile skipping lunch to ensure you have room for these generous meals. The desserts looked amazing but we were too full. Easy parking in the adjoining streets. Service was friendly and relaxed, and nothing was too much trouble. 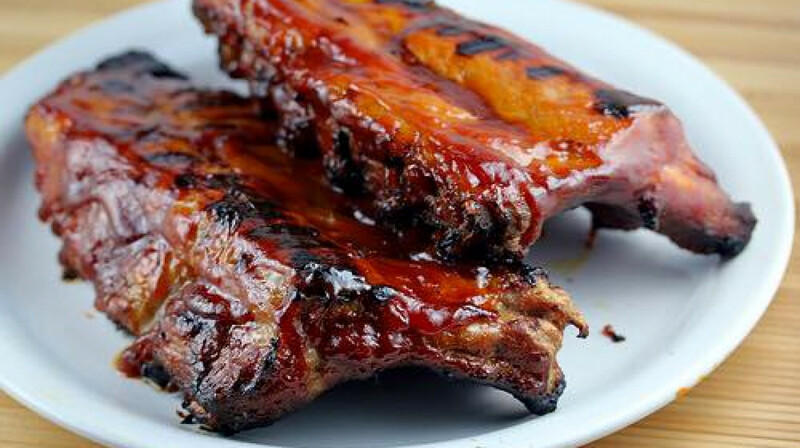 Really enjoyed our night and will be going back again.One night a week they have all-you-can-eat ribs nights so we are planning to take the kids to that. 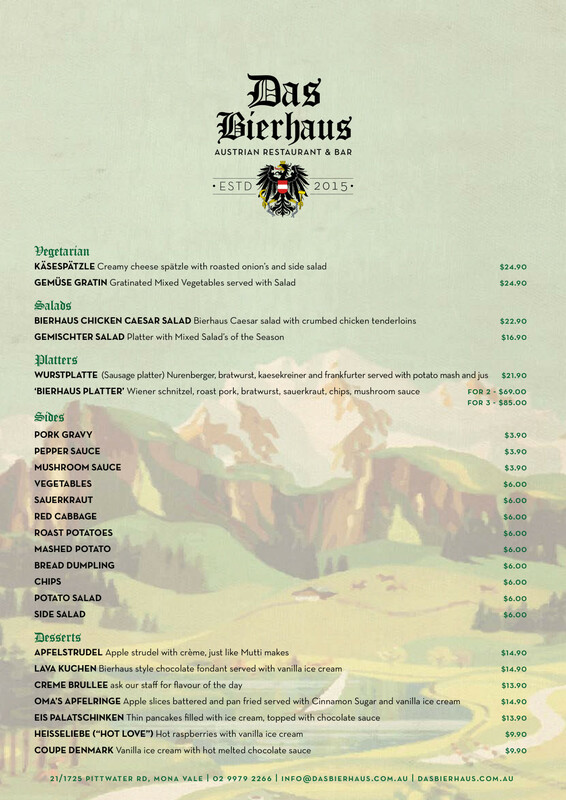 Do yourself a favour - try Das Bierhaus. Delicious food and friendly service. Looking forward to dining here again. We always have a great time at Das Bierhaus! Love the food and the service is always fantastic and friendly! Good food and good service. Portions were very generous. Lots of fun for the kids with a great kids menu and fun live music to dance to. The food is deliciously wholesome and beautifully cooked. Great restaurant. An Austrian band was setting up - so it seems that a fun night was ahead for the later diners. Heaps of families turning up. Great all-you-can-eat-nights and specials every night. Will definitely go back with the rest of the larger family. Good service & tasty food. The pork knuckle was a big serve. Had a great night here. Food lovely and massive servings. Other families were eating early with their kids and welcomed warmly. High chairs readily available. Friendly attentive staff. Had a really nice night. Thank you Das Bierhaus. Wow, lucky I wore my loose trousers because the food here is delicious and the servings are huge! We were immediately impressed by how attentive the staff were and this continued throughout the meal. We had garlic bread, the zucchini flowers, pork knuckle and ribs. Seriously delish. I highly recommend this restaurant and we will definitely be back soon! We were welcomed quickly and our orders were taken promptly. The food was awesome and the servings were generous.We weren't rushed out and enjoyed our meal immensely. Great food and the service was exceptional. The place feels like someone's own house so it's quite charming.